Boston: New York Graphic Society, 1979. First edition. blue cloth with burgundy cloth spine lettered in gilt. With original shipping box. Fine/pictorial dust jacket (very slightly rubbed at lower edge, tiny nick upper edge rear panel). Oblong folio. 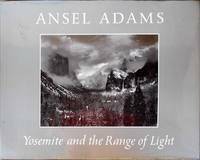 Illustrated with photgraphs by the author Signed by Ansel Adams on boookplate, Carmel California 1981 .